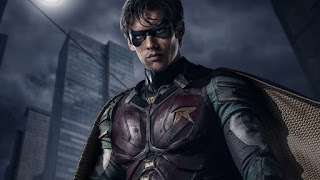 Wow, in the past, Titans, or Teen Titans was your typical comic book or animated series with a light sort of feel, but once you watch this trailer, you'll see they've made this a very dark version, a version with language. Oh, warning, there's a little language in this trailer. "A team of young superheroes led by Nightwing (formerly Batman's first Robin) form to combat evil and other perils." This is coming to the DC Universe On Demand streaming service. Which is a bummer, I'd like to have seen this, but I already drop enough $$ on dish and other streaming content.